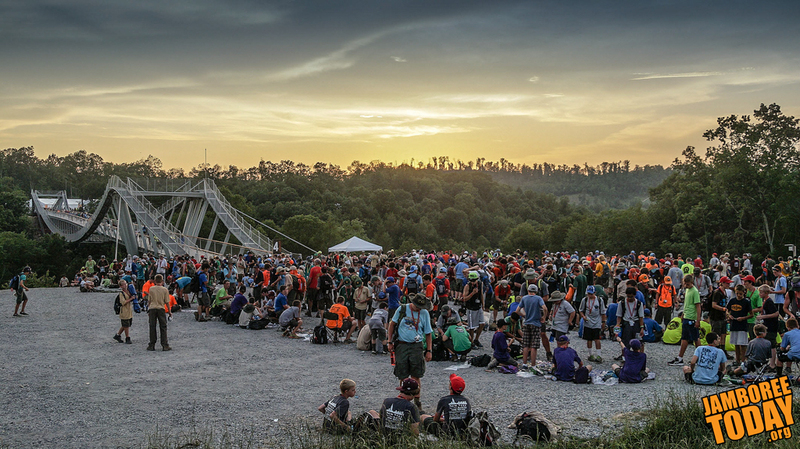 Thousands of Scouts and Venturers walk 100 feet above the valley floor across the CONSOL Energy Bridge. Photo by Eric Vickery. The bridge's unique design has many purposes, one of which involves the surrounding environment. "A goal of the project is to minimize disturbance to the valley below the bridge," says Schaun Valdovinos in a video about its construction. Valdovinos is a project manager with Hatch Mott MacDonald, the engineering firm that designed the bridge. Since June's official ribbon-cutting ceremony, Scouts, Venturers and visitors have enjoyed walking the bridges pathways and taking in the view from the top or bottom landing platforms. "The view is great," says Life Scout Michael Sweeny. "I think it's awesome. The swaying adds to the fun," says Life Scout Chris Lauer, one of the many people taking notice of the bridge's slight movement on the cable walkways. Some Scouts and Venturers have taken to patch trading on the bottom landing area. "It's cool. It brings more people in. You know they're serious if they come down here to trade with you," says Life Scout Jacob Wiper from Bothell, Wash.